This feature article has been contributed by thatDAMGuy aka Spencer J Harris. 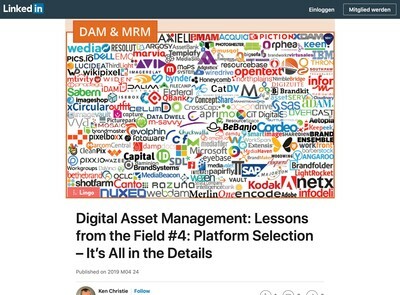 Back in September of 2017 I shared my initial review of Bynder’s new ‘Free’ cloud-based SaaS platform called Orbit, that they labeled as a digital asset management solution designed for ‘everyone’. Since this is intended to be a follow-up from my initial review I want to focus on what has and hasn’t changed since their initial release a little over four months ago. As part of my ‘homework’ to prepare this follow-up I reviewed some screenshots I had taken of Orbit on my first day of using the platform (September 8, 2017), along with reading the blog posts produced by Bynder about their new solution. Before I dive into the ‘before and after’ there a few things that stood out in Bynder’s blog posts that I want to touch on. The first article I want to look at is dated 31 October 2017 and is titled, ‘The guide to Dropbox alternatives’. This does a side-by-side comparison of the Orbit Plus account (which is the paid version) against the business versions of Dropbox, Box, and Google Drive. This is a helpful tool for comparing pricing and features of the solutions. However, it does support the statement I made in my first review: that Orbit is not a DAM, as they promote, but rather more of a robust file management solution, hence why they are comparing it to these solutions. If Orbit truly was a DAM, the comparison would be made against other DAM solutions. The second blog post I want to look at is dated 1 December 2017, was written by Emily Kolvitz, and is titled, ‘Breaking the mold with Bynder Orbit’. This starts off with comparing the innovativeness of Apple ‘making products that people didn’t know they wanted and now can’t live without’, and how Bynder has followed Apple’s example with Orbit (i.e. it’s supposed to be another product people can’t live without). 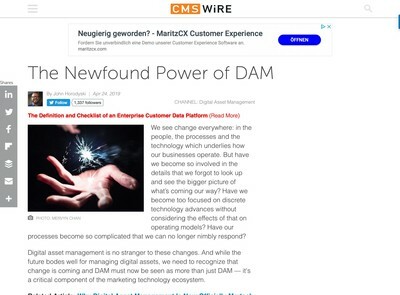 I am all for being bold, where appropriate, but this is quite a stretch as Orbit cannot be said to have revolutionized the DAM industry nor is it particularly innovative for any other reason than it has a free edition. The article continues by making the statement that Bynder has become a ‘world-leading pioneer’ in the DAM industry. I must ask, what exactly have they pioneered? At this time I can’t find anything they uniquely have created for the DAM industry, in the same way that Apple did with the iPhone. I do invite the Bynder team to please elaborate on this claim, because otherwise it is groundless, and they should retract it. Furthermore, the article attempts to ‘dispel myths about Orbit’ by claiming they don’t need to follow the 10 Core standard used to determine if a solution is truly a DAM. 10 Core was created back in 2014 by the now defunct DAM Foundation and a lot has changed in the industry during that time and it should probably be updated to include additional requirements, but certainly none should be taken away from it. The issues with that standard are not that excessive for modern DAM, quite the contrary. Regardless, I find it interesting the approach Emily has taken is to play down their need to meet or pass the industry checklist just so they can feel better about calling their solution something it really isn’t. This points to the fact that Orbit is a Dropbox alternative, not a substitute for another DAM. Emily’s article criticizes ‘DAM industry veterans’ by saying they are not in touch with the everyday needs of users. The reality is, however, that the DAM vets are usually also everyday DAM users and integrators. They are the ones who provide feedback to solution providers such as Bynder, so they know where and how to innovate (if only they would actually listen). It seems to be a hypocritical statement by a solution provider to lessen the reality that Orbit still isn’t what they try to say it is, a DAM solution. Since Bynder first made the Orbit platform available to the public in September of 2017 they have been adding new features every month at an average of six per month. You can find the detailed list here and I must congratulate their dev team for their commitment to keeping the product updated. At the time of this article, however, there have been no new features added for January. I want to briefly highlight some of the new features, which include the ability to upload files from Dropbox and Google Drive, additional ways to share files, the ability to set a ‘status’ for your files, and some lite ‘reporting’ of most viewed and downloaded digital assets. 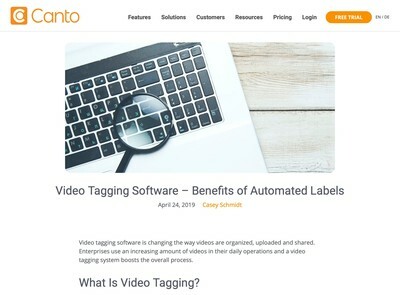 The most notable change in the user interface is this ‘channels’ idea as a method of grouping and executing batch actions such as download, share, and edit. A pseudo-workflow capability is also possible using this feature. Some channels are created as defaults and automatically ingest digital assets based on metadata. You can also create custom channels and manually add content to them. Channels have been added to a ribbon just above search results so you can access them quickly. I have noticed that to get out of a specific channel (and back to the view of all assets) I need to open a hidden menu and choose ‘Files’. Otherwise, when inside a channel there is a path ribbon that allows me to go to an overview screen of all them. I would say this is an aspect of the interface that needs improvement. It is not intuitive to go hunting for the option to view all assets when in a drilled-down view. From a design and functionality standpoint, this platform is progressing at a good speed, especially compared to many other solutions on the market. Some vendors only put out new features once every quarter or six months, so to see an average of six new features month after month for four months is a good sign. Time will tell if they keep up with this trend or taper off. They do have a page on their website that shows some of their design roadmap, which can be viewed here. Another change is that Bynder has seemed to pull away from promoting Orbit as a platform designed for ‘your mom and neighbor’, but rather now for professionals. If you visit their roadmap page and scroll down, you will see a video that promotes the use of Orbit with colleagues instead of family and neighbors. This is better aligned with the functionality and pricing of the platform. Another big change to the solution is the pricing and what is included in each edition. This first screenshot shows what was included when Orbit was first launched in September 2017. You will notice that the pricing is in Euros and not U.S. Dollars, the list of inclusions was so vague that you couldn’t tell if the paid tier was priced per account or per user. You will also see that you could get an early bird discount of 100 Euros a month and the offer was available until January 11, 2018. However, when I took my latest screenshot on January 10, 2018 the promo was no longer shown. 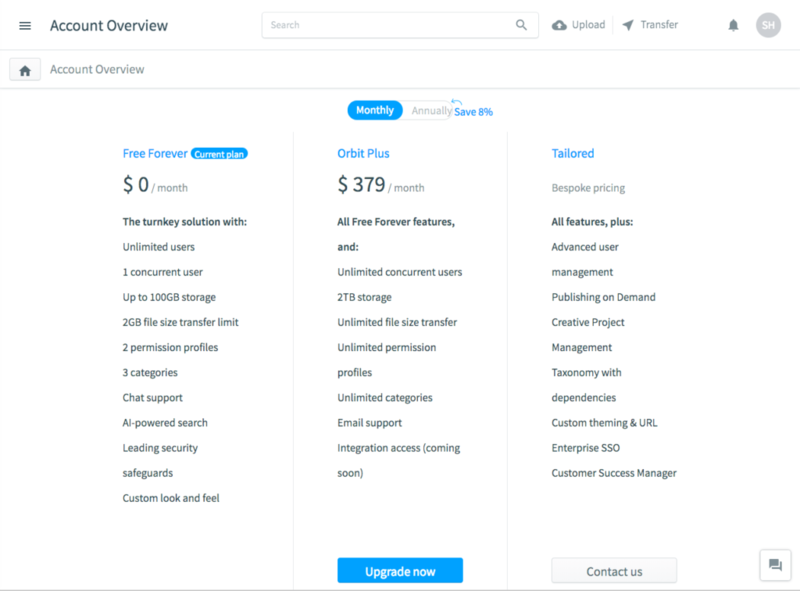 The biggest change with the new pricing structure is that it is now clear that it is for the entire account, which allows for unlimited concurrent users and other features, 2TB of cloud storage, and email support. All of the ‘Plus’ features are in addition to the ‘Free Forever’ account. The Orbit Plus option was officially made available on November 28, 2017, according to Brian Kavanaugh’s blog post titled ‘Going unlimited with Orbit Plus’. Up to that point early adopters of Orbit could only secure a promotional price of the upgraded tier. The cost to upgrade from the ‘Free Forever’ account is still really steep, especially if you are a single user or a small team of 2-3. The Plus edition comes in at $379 USD a month and for just one user the platform will cost $4,548 USD a year. 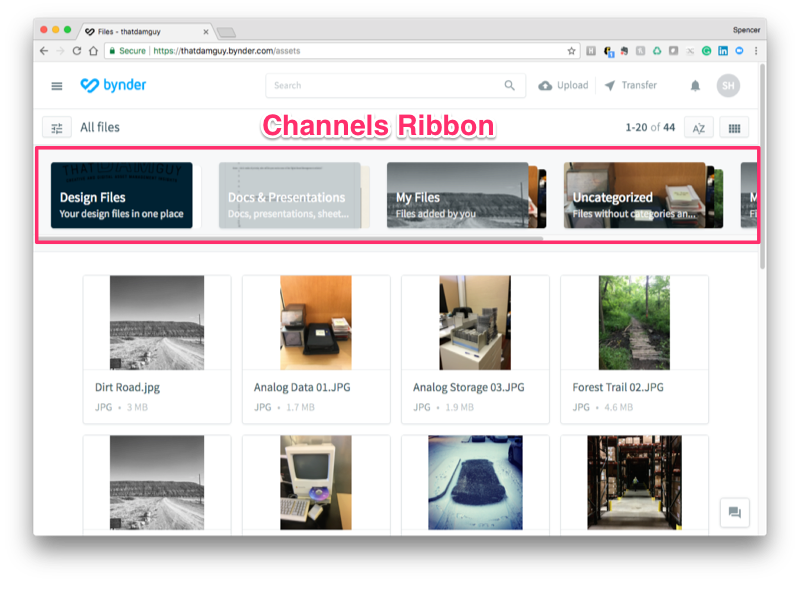 According to the blog post by the Bynder marketing team I referenced earlier in this review, you would need to have a team of 40 users before their solution becomes less expensive than the business version of Dropbox or Box. At a team size of 40 or more users an organization should consider moving beyond a ‘Freemium’ or ‘lite’ solution and into mid-market or even enterprise platform instead (which Bynder conveniently happen to offer as well). This pricing plan doesn’t seem to be very practical for small businesses (10 users or less) or single users. The ‘Free Forever’ plan still comes with 10GB of cloud storage, which can be expanded up to 1000GB if you invite 10 others to use the solution, just like Dropbox with the only difference being a larger amount of base storage. Orbit still has a marketplace to allow for integrations with other solutions such as Box, Dropbox, Slack, and Adobe CC, but after four months these integrations are still unavailable. One feature that has been in the platform since it was launched is a file-transfer capability that allows users to use Bynder’s Orbit as a file sharing facility. Note that when you use this feature, a copy of the file is not saved into your account. This can be seen as both a positive and a negative (and depends on whether you might plan to do something else with those files later within Orbit). It would be nice to have the ability to copy assets to your account that are part of the transfer. One big feature missing on both the free and paid plans is the ability for an account user to simply increase the amount of cloud-based storage for a fee. 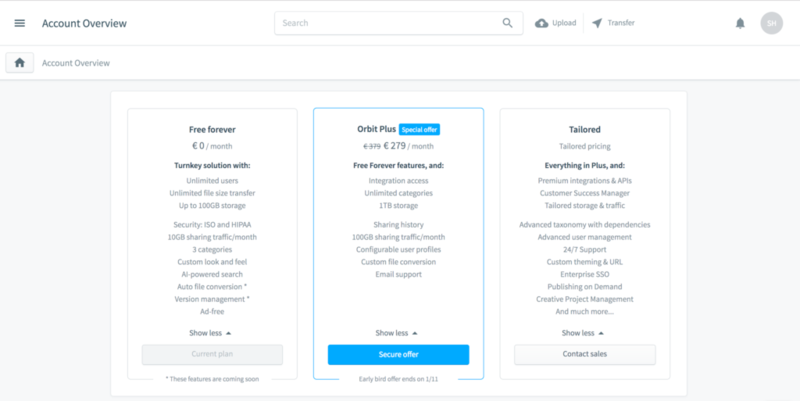 Unlike Dropbox or Box, the only way to get a reasonable amount of cloud-based storage is to pay the high upgrade fee to the Plus edition (other than by inviting others to use the Bynder Orbit solution). It would be nice to see an option where individual users or small groups could purchase a storage upgrade only. Another feature currently missing from Orbit is the ‘brand guidelines’ module that they offer in their main solution. Even for small businesses, it is still necessary to manage a company’s brand identity. Providing the option to add this feature to a plan would increase the level of usefulness of the Orbit solution to these types of users. This is a common theme with Orbit (and a number of other DAM solutions), it is not possible to more selectively pick and choose what features you do or do not require. End users are locked into whatever the vendor deems suitable for them at a pre-determined price point. If Bynder wants to be considered innovative (in the mold of Apple etc.) then this would be one way they could demonstrate their intent. It isn’t clear where the line will be drawn functionality-wise between Orbit and the main Bynder solution. Perhaps this is deliberate, and Orbit is really just a marketing strategy to draw users into their main solution? Like many other solutions in the DAM market currently, Orbit has aspects of it that are both positive and negative (and which depend a lot on the use-case in-question). 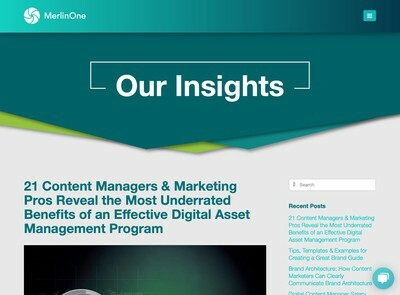 As described earlier, if the team behind Orbit keep adding functionality at their current rate then it might soon acquire all the necessary characteristics to be called a true Digital Asset Management solution. The solution has the (as yet unrealized) potential to be out of this world, but it is dependent on Bynder to avoid it crashing back to earth and disappearing among the multitude of other homogenized SaaS DAM Lite platforms that users can now choose from.